Here you can manage existing roles or create new roles. Any roles that are created may be assigned to a user. Roles may be assigned to or removed from any user by using the Manage Users dialog. Users may also be assigned to a Role through the Manage Users page. Most of the roles in the list will be build it roles. As such, they can not be edited or deleted. Only user created roles can be edited or deleted. Editing an existing role will retroactively affect all groups and users who possess this role. A role is a security permission that grants access to certain areas of the site, depending on the role permission. For example, certain pages might have limited capability or be locked out for any user without a specific role. 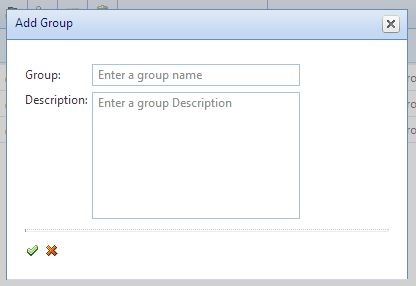 Here you can manage existing groups or create new groups. Users may be assigned to or removed from any group by using the Manage Users dialog. Users may also be assigned to a Group through the Manage Users page. Use the add/remove roles icon to open the window to adjust the roles assigned to this group. The Email User icon opens a window that lets you email every member of the group. Email settings will have to be correctly setup first on the Manage Server page. Editing an existing group will retroactively affect all users who are a member of that group; changing the role of a particular group will affect all current users that are a member of that group. 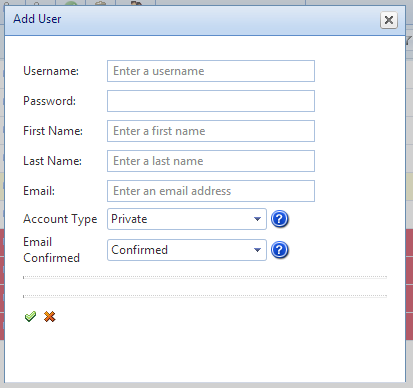 Here you can manage existing user accounts or create new user accounts. Users may be assigned to or removed from any group by using the Manage Groups dialog: Users may also be assigned to a Group through the Manage Groups page. 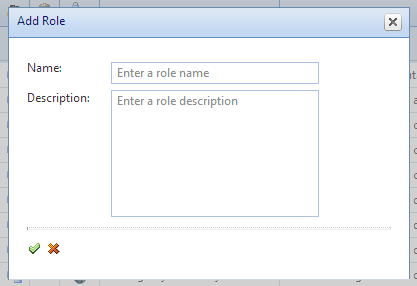 You can modify an account to change individual assigned roles by using the Manage Roles dialog. Users can be active/inactive. The row will be red if the user is marked inactive. Clicking the green check mark icon (4th column) with switch a user to being inactive. Conversely, clicking the red circle x icon will switch a user to being active. Inactive users cannot log in. Username: The user name. Required. First Name: Displayed in the top right of the screen on the front end or in the menu in the Administrator. Required. Last Name: Displayed in the top right of the screen on the front end or in the menu in the Administrator. Required. Email: A valid email account Required. Account Type: Choices are Private or Public. Private means that it is a normal, single user account. Public means that multiple people will use it to log in. Users cannot change or reset (through the lost password interface) their password, it can only be set on the administrator side. An auto log in pass through link can be created using this account. Email Confirmed: Choices are Confirmed or Unconfirmed. Unconfirmed will generate a confirmation email to be emailed to the user. Required server email settings to be correct to send the mail (see the Manage Server page).